After starts and sputters and a lukewarm reception, Bintan Resorts finally appears to be coming into its own as it enters its second phase of development. Just 45km south-east of Singapore, Bintan promised to become a weekend hot spot of family fun and an idyllic island getaway when Indonesia and Singapore agreed to co-develop the island and the Riau province in 1990. The governments designated the entire northern coast of the island for tourism, and the 17,500ha parcel of land, which is masterplanned and managed by Singapore- and Indonesia-owned investment company Gallant Venture, became home to eight independently owned and operated resorts, such as The Banyan Tree Bintan, four golf courses and recreational facilities and attractions including parasailing and mountain biking. Yet the 1997 Asian Financial Crisis, mixed reviews of resorts, cash-flow problems for some investors and outbreaks of malaria and mob violence on the island diminished investor and visitor interest after a spate of construction in the mid- to late-1990s. It reached the one-million visitor mark in 2000, though in 1996, Bintan Resort Management thenchief executive Yeo Nai Meng had said the resort hoped to entertain 1.5 million visitors in 2000 alone. Though some spas and leisure activities have opened in the intervening period , it has been 14 years since the last resort - the Angsana Bintan - opened there in 2000. But interest and investment are returning, thanks in large part to better infrastructure. New roads and bridges have halved travel time between Bintan Resorts - the 17,500ha designated for tourism development- and the island's capital Tanjung Pinang and cultural sites in the south. The construction of an international airport, scheduled to open in 2017, will also help connect Bintan with greater numbers of Indonesian and international tourists. At the moment, almost all visitors to Bintan's resorts arrive by ferry via Singapore's Tanah Merah Ferry Terminal because the island's airport is too small and ill-equipped for frequent domestic or regional flights. Mr Asad Shiraz, spokesman for Bintan Resorts, which is a subsidiary of Gallant Venture, notes that Bali receives more Indonesian than foreign visitors. He hopes Bintan will follow the same route, but it is tough for Indonesians to get to the island now, he says, as most must go through Singapore first. The French hotel group AccorHotels is banking its investment in Bintan on this future influx of Indonesian travellers. It will open four hotels on the island in the next five years and Mr Garth Simmons, chief operating officer of AccorHotels in Malaysia, Indonesia and Singapore, says the new airport will make it an easy getaway for young, increasingly affluent travellers in Indonesia and Malaysia. Ms Natalya Pavchinskaya, owner of The Sanchaya luxury hotel, which was the first to open in Bintan's Lagoi Bay in December last year, says: "Most major world cities have a go-to retreat where the well-to-do flock for a weekend escape. They're nearby, upscale and restorative. Due to the ease of access, Bintan is an ideal retreat for those wishing to escape Singapore or Jakarta for the weekend." Lagoi Bay is one of two key areas in Bintan's second phase of development. The other area is Treasure Bay Bintan, a 338ha integrated resort city that is a five-minute drive from the ferry terminal. The principals of Malaysian real estate developer Superboom Projects, behind The Haven luxury resort in Lagoi Bay, were impressed by the area's potential when they visited it three years ago. A pristine seafront and the proximity to Singapore convinced them it was a great investment opportunity. "These conditions make a perfect setting for a vacation or retirement home and a popular place for family vacations and team building," says a Superboom Projects spokesman. Treasure Bay Bintan, owned by Malaysian hospitality investment and destination development company Landmarks, will offer wellness, adventure, family-friendly and luxury holiday opportunities in its waterfront property. It opened earlier this year with The Canopi luxury camping resort and a 6.3ha filtered-seawater Crystal Lagoon, where one can swim and enjoy water activities such as paddleboarding and wakeboarding. Bintan received a record half a million visitors last year and Landmarks group chief operating officer Fong Chee Khuen says that as Bintan continues to welcome an upward trend in visitor arrivals from Singapore, China and beyond, visitors can expect to see a dramatically different island within the next 20 years. 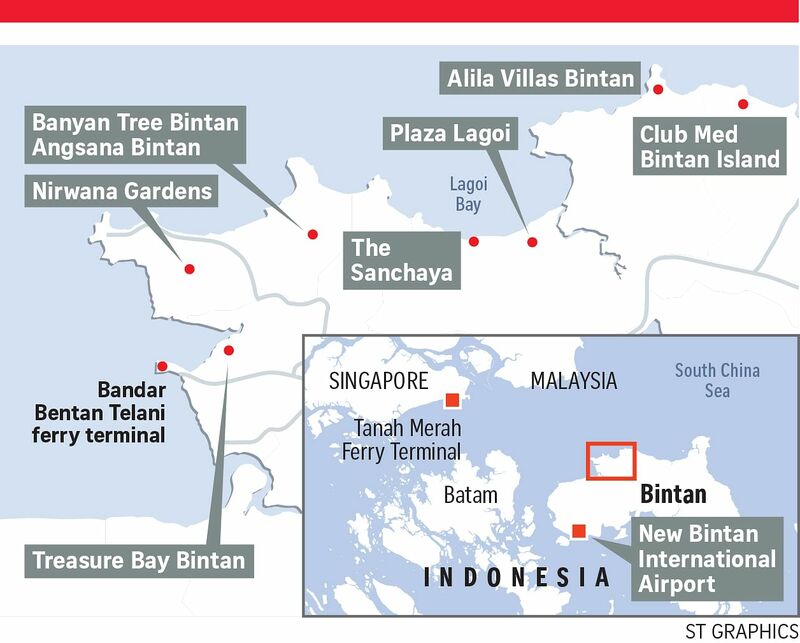 So far, less than a third of Bintan Resorts' 17,500ha - an area 35 times the size of Sentosa - has been developed. Bintan Resorts' Mr Shiraz says development will continue as and when partnership and investment opportunities arise. These changes and more cultural and family-friendly activities are what visitors like Ms Michelle D'Cruz are looking for. The 44-year-old housewife, who stayed at Club Med Bintan Island in December with her husband and children, aged six and eight, says: "Bintan has a rural charm, but I don't think there is a lot to do outside the resorts. It looks underdeveloped and the activities they advertise, like water-skiing, don't seem safe. The cultural and adventure activities look more sophisticated in places like Penang and Phuket." It is a perception and reality which Bintan Resorts and its hotel partners are working to change. Mr Shiraz says areas south of the beach and around the reservoir are earmarked for nature and watertable preservation, but there are talks of future golf courses, ecoresorts and maybe even an animalthemed resort development, where guests would spend the night in a wild safari. Such a development would be an opportunity to not only highlight Indonesia's wildlife, but act as a sanctuary as well, he says. Sea gypsy villages, hundredyear-old temples and forts are just some of the sites now within an hour's drive of resort properties and can be visited on tours organised through Bintan's hotels. "Bintan is really in its infancy compared with other island destinations in the region such as Bali, Phuket and the Philippines, but it has a pristine natural setting, is close to Singapore and has an interesting, vibrant, but seldom explored hinterland, so there is room to grow," says Mr Shiraz. Tucked among mangrove forests just a five-minute drive from Bintan's Bandar Bentan Telani ferry terminal, visitors will find Treasure Bay Bintan, a new 388ha integrated resort city where luxury meets adventure and family fun. Malaysian property developer Landmarks has spent $250 million to buy the land and $50 million on development costs so far. The Canopi, a 41-suite resort which opened last month, offers guests a chance to go "glamping", or camping without the hassle, dirt and sleeping bags. The resort's 37 sq m tents include an ensuite bathroom, air-conditioning, a four-poster bed, LCD television and Wi-Fi, and some have an outdoor jacuzzi and barbecue pit in a private, ensuite garden. Guests can lounge in hammocks, toast marshmallows over their campfire or take part in one of the resort's many activities, such as day and night tours of the nearby mangrove and estuary, all-terrain vehicle rides through the forest, or grab a kayak, jetski or guided boat cruise to explore Treasure Bay's private mangrove reserve and see its exotic wildlife - including kingfishers, raptors and otters - up close. Water sports can be found at the beach or the resort's Crystal Lagoon, a 6.3ha, 800m-long pool of filtered seawater. It also houses an inflatable waterpark - a floating raft of obstacles, trampolines and slides - a first in Asia. Development of the resort is expected to continue over the next 20 years, as more hotels and amenities come on board. However, phase one of Treasure Bay's development is expected to be completed at the end of next year, with the opening of the award-winning United States-based Canyon Ranch. The 21ha wellness property will offer holistic health management and nutrition programmes in 64 hotel suites and 64 high-end residential villas. Phase two, which will start in a few years, will include the development of eastern wellness resorts, water villas, private residences, the opening of Mercure and Ibis Budget hotels, and a marina which will serve as a gateway to other islands in the Riau Archipelago. When award-winning luxury hotel The Sanchaya opened in Lagoi Bay in December last year, there was little else in its backyard except construction and vacant land. But the pace of development is picking up in the area. The 196-room four-star Swiss-Belhotel opened in May, as did Plaza Lagoi mall, less than 200m next door. The two-storey mall has close to 60 stores spread over 1,000 sq m of retail space. About 45 per cent of the shops are open, selling Indonesian gifts, cultural artefacts, clothes and necessities. In the same month, Pasaraya, Indonesia's largest department store, signed on to be Plaza Lagoi's anchor tenant, and six new hotels - Four Points by Sheraton, Ibis Style, Novotel, Dialoog, Prime Plaza and Ambhara - signed up to manage hotels in Lagoi Bay. These range from budget to four-star accommodation. By June next year, Pantai Indah, Bintan's first seaside residential estate, will complete its first phase of development and 99 of its 146 pool villas will be walk-in ready. The one-, two- and four-bedroom villas, which start at $400,000, come fully furnished and are part of an effort by Lagoi Bay's Singaporean and Indonesian developer PT Bintan Resort Cakrawala to establish a year-round residential community within Bintan Resorts. Bolstering the island's roster of luxury properties, award-winning hotel and resort management company Alila is opening Alila Villas Bintan in the first half of 2017. The gated, hillside property will include beachfront residences and one- and two-bedroom guest villas. Aside from a wellness retreat, it will also feature a 4ha village with boutiques, an art gallery, cooking school, restaurants and a museum with a prized historical batik collection and one of the largest collections of Indonesian ethnic art. Malaysian real estate developer Superboom Projects has broken ground on a 26ha beachfront property in Lagoi Bay, which will include a five-star 300-room hotel, a 1,000-seat convention centre, eight condo hotels, 32 villas, commercial space and a full range of amenities, including restaurants, sports facilities and a boardwalk. It should be completed in eight years. The Heritage Bintan condo hotel, suites and service residences, developed by Gallant Venture but managed by Singaporean group Far East Hospitality, has laid the foundations for its 218-room property, scheduled to be completed in 2017. I lazily step off the ferry onto Bintan island, ready to join the rest of the passengers at the immigration lines to go through Customs. Suddenly, I spot a smiley man eagerly waving a placard with my name printed on it and I head over. He picks up my luggage and whisks me away to a private lounge where he offers me hot tea and dried fruit. It is an elegant and airy room, with Balinese room dividers and opulent leather-tufted sofas, done up exactly in the style of The Sanchaya resort, where I will be spending the next two nights. He asks me for my passport and as I sit back on the leather couch, I realise he is going to go through Customs and baggage checks on my behalf. The only thing I have to do is relax. I learn later that all this is part of the "seamless arrival experience" by The Sanchaya, the only property on the island that offers this service. Indeed, it is testament to the hotel's promise to deliver on a truly luxurious experience for guests. The Sanchaya is a breathtakingly beautiful property. 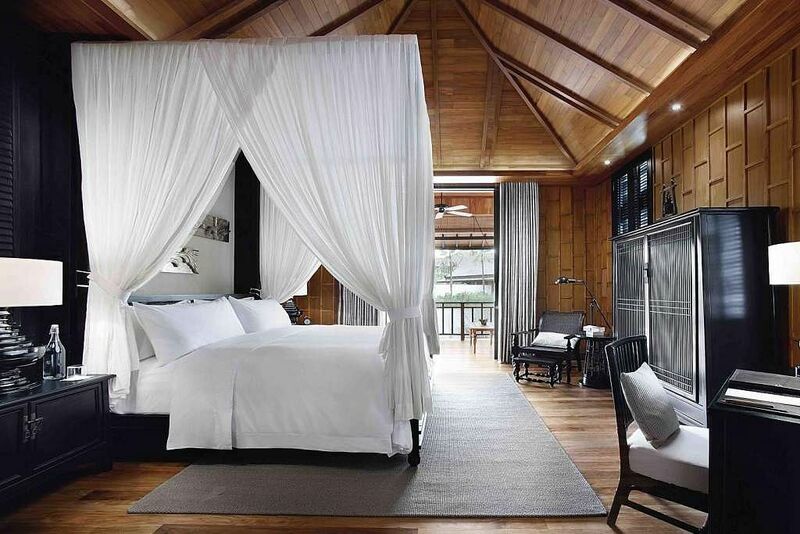 Opened late last year, it is developed and owned by Singapore-based Russian businesswoman Natalya Pavchinskaya, a frequent traveller to Bintan who wanted to introduce a new level of luxury vacationing to the island. Since its opening, it has been included in travel magazines' must-visit lists, such as Conde Nast Traveler's hot list of best new hotels in the world for this year. The Sanchaya is located at Jalan Gurindam Duabelas, Plot 5 Lagoi Bay, Bintan. Rooms start at a promotional rate of US$560++ (S$775++) for a Great House Junior Suite Garden View till Dec 31. At the centre of the sprawling 9ha property is The Great House, a two-storey mansion that houses not only nine lovely suites, but also the bar and library, a meeting room and the main restaurant known as The Dining Room, where I have all of my meals. The menu covers both Asian and Western cuisines, but the local dishes impress me the most. The beef rendang is one of the best and most tender I have eaten in a while. Its bread, all warm and baked in- house, is also some of the crustiest and most fragrant I have tasted. At breakfast, look out for the woman who serves up healthy Jamu, a traditional Indonesian drink using natural ingredients such as tree bark and flowers that work as herbal medicine. But the porch along the back of the building is where I spend the bulk of my stay, lounging on rattan chairs with a drink in my hand as I look out onto the 50m infinity pool and the tranquil, turquoise sea beyond. There is a spa - its signature massage (US$160 or S$220 for 105 minutes), which features warm volcanic stones and a rejuvenating oil massage, is the ultimate destresser. Other activities include croquet as well as guided cycling and hiking tours around the island. Like the rest of the property, my one-bedroom villa is modelled after the black-and-white bungalows typical of British colonial architecture. The interiors, done by Bangkok-based P49 Deesign & Associates, are tasteful and sophisticated, with sleek grey and white walls, plush sofas and hardwood floor. Everything in the 130 sq m space screams luxury, from the Egyptian cotton bedsheets to the Apple television and the lovely free-standing bathtub sitting in the middle of my stark white bathroom. It is where I take many long bubble baths while taking in the view of my private garden outside. As wowed as I am by all the stylish fittings, it is the conscientious service by the hotel's staff that truly leaves a mark. The young team of mostly local Indonesians is always one step ahead of me, anticipating my needs. I lie down on the pool deck chair for just five minutes and a pool boy hurries over with a basket filled with complimentary bottles of still and sparkling water, cold towels and a refreshing facial mist spray. At night, during turndown service, the resort does a lot more than just provide guests with the typical chocolate mint. Instead, staff members bring me a large pot of steaming hot chocolate and a stack of massive chocolate chip cookies. You certainly get what you pay for because the exquisite furnishings and ultra-attentive service come at a price. With rooms costing US$645++ for one night in the one-bedroom villa, this is not a cheap getaway. But when the cost of a comparable luxury resort in say, the Maldives, is upwards of US$2,000, this is a more affordable alternative that is closer to home. My only problem - if you could even call it that - is how deathly quiet the entire place is. I am told that the hotel is often booked out over the weekends, but during my weeknight visit, I never saw another guest. Some people will find the solitude liberating, but I am terrible when it comes to entertaining myself, so it feels borderline scary, especially in the late night. For the world-weary Singaporean traveller craving a truly secluded and indulgent getaway nearby though, this is the place to be. •The writer's trip was sponsored by The Sanchaya.